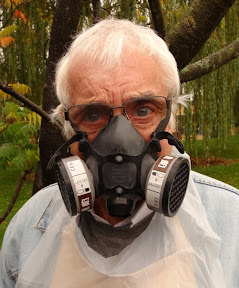 No, but it is my protection when making the bronze head as the fumes from the various resins and bronze ingredients, when mixed up, can cause real problems. Shirley, my sculpture teacher, found to her cost the other day the effects of the fumes which put her out of action for a while with a splitting headache. 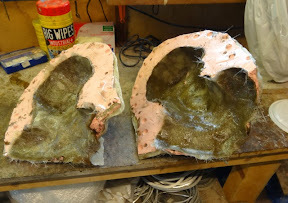 This picture shows the two halves of my most recent bronze head encased within its heavy fibreglass jacket. Most of my time this past week has been taken up with the final preparations for my exhibition this coming Saturday. I did, however go for a blood test and CT scan at the Dunedin hospital in Reading on Thursday - much nicer than previous scans at the Royal Berkshire hospital - they give you a cup of tea and a biscuit after the scan, and I don't have to sit in a windowless and cold cupboard dressed only in a hospital gown. And then on Monday afternoon my young friend drove me to Dr Gildersleve, the oncologist, for the results of the scan. Great relief - my blood is 100% and I'm clear of cancer. 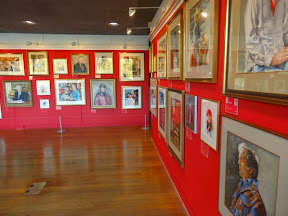 So on to the exhibition. 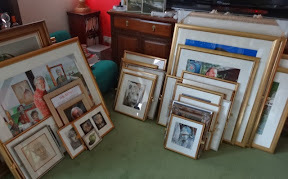 I thought my home would become completely denuded after removing almost all the paintings from the walls, but I still have quite a few left that won't be on display at the exhibition. 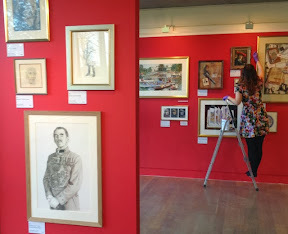 Here's what my lounge looks like before we transport the paintings to the River and Rowing Museum. Have a look at this painting. 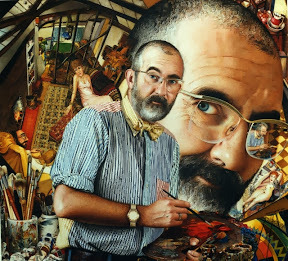 It's called 'Portrait in Time' and is of Royal Academician Anthony Green. If, however, you look very closely at the watch on his wrist you may notice the hands moving - and keeping the correct time. David Card, the clockmaker, has attached a real watch movement to the back of the painting with only the centre spindle protruding through to the front. Friends Brian and Guy have offered to help me take the paintings and drawings to the museum and as we have over one hundred to take there, if we are lucky we may be able to do it in three journeys. 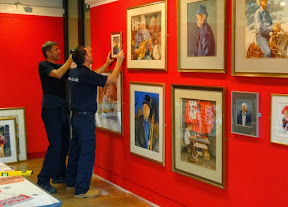 Now the preparations are underway in the museum itself. 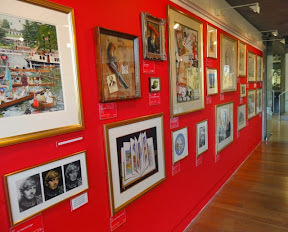 This is The Lord Kirkham Gallery. 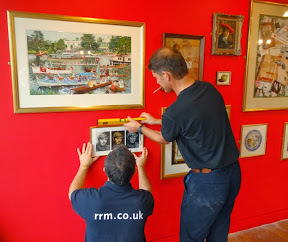 And here are the very experienced Matt and Andy fixing the paintings to one of the walls. 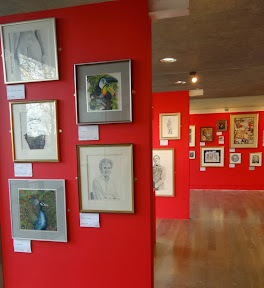 Another view as the hanging progresses. This solid concrete wall took a bit of tough drilling to get the screws in. Lindsay, the assistant curator, is doing a good job in painting over the brass mirror fixings. I think I'll re-do all the white descriptive labels as they detract too much from the paintings themselves. So yesterday evening I spent hours printing and shaping all 70 labels - this time in red. i needed the expert help of my young friend to work out how to change the colour as I had no idea what to do. 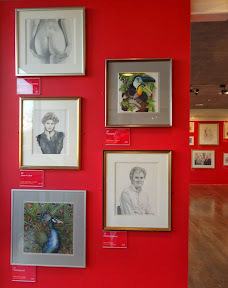 But what a difference they make - the paintings and drawings will not now be in competition with the labels. Four large panels will be securely locked in place within the lectern cases on the riverside part of the gallery. Too bulky to fit in our cars I hired 'a man with a van' to transport them to the venue. With over 30 miniatures displayed on the panels they needed to be very carefully handled. Here are three of them. As people often ask how I commence work on a painting the panel above demonstrates all the many stages of my large picture 'When the Queen Came to Henley'. So at last, after many months of work, all is ready for the opening tomorrow. And here is the result. 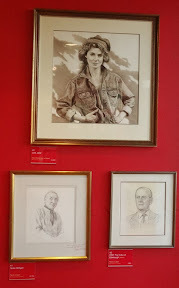 The exhibition opens this Saturday with the Private View at 3pm which will be opened by Sir William McAlpine, and will run till February 2nd next year. 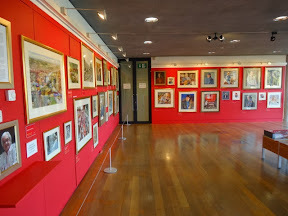 The River & Rowing Museum in Henley is counted amongst the 50 best Museums in the world, and apart from my exhibition, 'The Art of Bill Mundy', is well worth seeing.